Pursue the Art of Cuisine! Master basic to advanced culinary techniques which can be applied to any style of cuisine. Explore French culinary tradition, cuisines and current trends from around the world. The cuisine programmes are divided into three levels: basic, intermediate and superior. 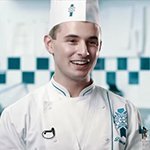 All three levels in cuisine must be successfully completed in order to receive the Cuisine Diploma (Diplôme de Cuisine). This 3-month certificate course is an in introductory into classic French cuisine. The programme opens the door to the adventures of French cuisine. From day one, students begin to master the basics levels of: knife skills, peeling and preparing vegetables, trussing a chicken, filleting fish and integrating sauces, stocks and spices into dishes. 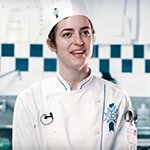 This 3-month certificate course introduces students to French regional dishes, using the techniques acquired in the basic level plus more advanced techniques. The programme focuses on the importance of color, taste, and texture combinations as well as mise en place: understanding, organization and production. This 3-month certificate is the final level in achieving the Cuisine Diploma and prepares students for their professional career as a Chef. 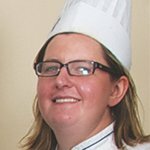 Students will gain the utmost advanced techniques in cuisine including precision and efficiency in the kitchen, working with recipes that include high quality products and richer more refined ingredients. The world class Chefs at Le Cordon Bleu Ottawa have trained in the finest restaurants and hotels. Student to chef ratios of 14:1 ensure that you receive personalized attention that builds your confidence and skills. The layout of the kitchen lends itself to constant feedback from the chefs. Watch our master chefs prepare selected menus in demonstration theatres featuring close-circuit cameras, mirrors and audio systems. Then practice and replicate recipes in professionally equipped kitchens designed with individual workspaces, including your own gas oven. The chefs will be in the kitchen with you, mentoring and guiding you along the way. Each graduate leaves Le Cordon Bleu Ottawa with the skills to launch an exciting career not only in the world’s leading restaurants, hotels or catering establishments, but also as a journalist, author, instructor, consultant or entrepreneur.Over the past 100 years, Le Cordon Bleu has produced many famous graduates, including Dione Lucas, Julia Child, Nancy Silverton, Nathalie Dupree, Eric and Bruce Bromberg, Allen Susser, James Peterson, Lydia Shire, Giada De Laurentiis, Gaston Acurio and Ming Tsai just to name a few. Discover (or Master) the art of French cuisine.